Looking for a great and delicious way to make bananas? Give this recipe for cinnamon-spiced bananas a try. 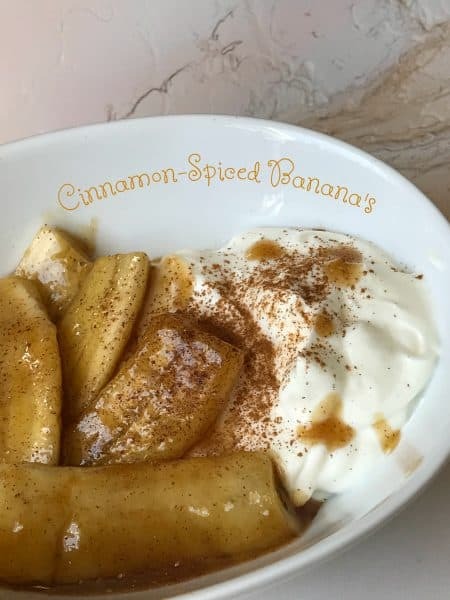 Even though I’m watching what I eat, I still get a craving for something ‘sweet.’ Cinnamon-Spiced Bananas would no doubt be super fantastic spooned over a very large bowl of vanilla or cinnamon ice cream, but since I don’t want to totally ruin my diet, I decided to serve warm cinnamon-spiced bananas with plain Greek yogurt. I think I just found my new ‘sweet’ treat. It was super good! Slow Cooker Bananas Foster is a fantastic recipe to make and serve right from your crock-pot. 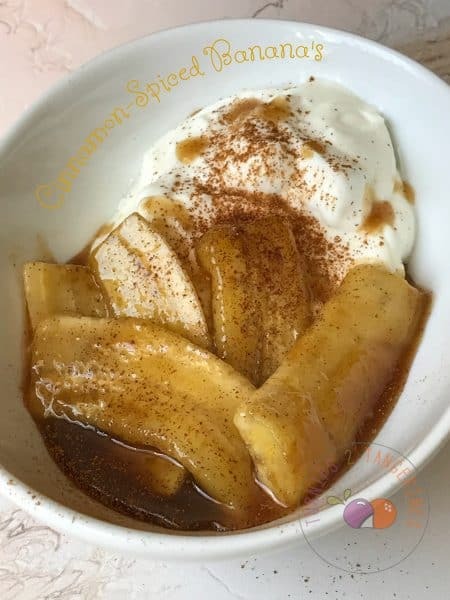 Slow Cooker Bananas Foster is traditionally served over vanilla ice cream but cinnamon ice cream or butter pecan ice cream would also be great choices. Banana’s make for an easy and delicious dessert option. When you really think about it, economically speaking, banana’s are cheap! Not only are they cheap, banana’s are available everywhere. So what are you waiting for? Go pick up a bunch of banana’s and make some dessert! Instead of spooning over vanilla ice cream, try plain Greek yogurt. In a small skillet over medium low heat melt butter. Stir in brown sugar, vanilla extract and ground cinnamon. Heat stirring constantly, for 2 minutes. Meanwhile peel bananas. Slice bananas in half lengthwise, then slice banana slices in half. Should have a total of 12 slices. Add banana slices to the butter/brown sugar mixture and heat for 2-4 minutes or until bananas are warmed and mixture is bubbly. Divide Greek yogurt between 4 bowls. 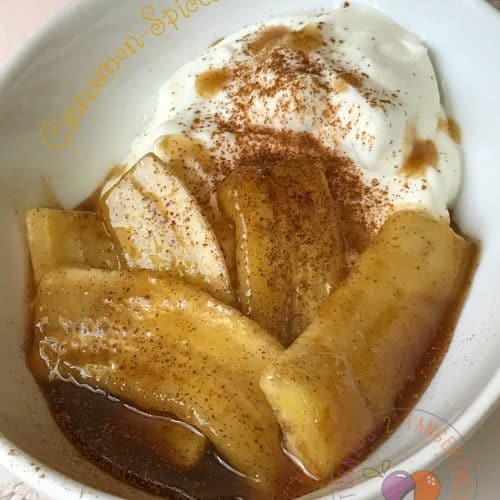 Spoon bananas with sauce over yogurt. Sprinkle with cinnamon if desired. Serve. 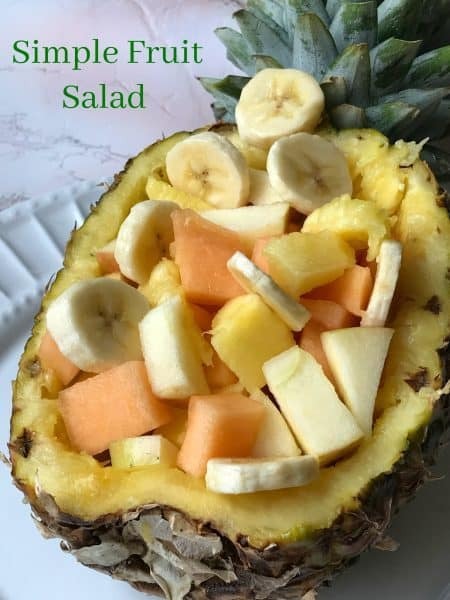 What’s Cooking in the kitchen is a super Simple Fruit Salad served in a Pineapple Boat. Fresh pineapple, chopped honey crisp apples, sliced banana’s and cantaloupe cubes. The fruit is then tossed together with sweetened flaked coconut and lime zest. This yummy fruit salad combination is served in a pineapple shell and drizzled with honey and lime yogurt. Super delicious and good for you too! Brown sugar is a mixture of granulated sugars and molasses, with dark brown sugar containing more molasses than light brown. Light brown sugar has a delicate flavor while dark brown sugar has a stronger molasses flavor. They can be used interchangeably.